Carlsbad eye doctor, Dr. Tracy grew up in San Diego and received his undergraduate degree from the University of California at San Diego. He attended medical school at Columbia University, College of Physicians and Surgeons, in New York, NY. He completed his residency training in Ophthalmology at the Scheie Eye Institute, at the University of Pennsylvania, in Philadelphia, PA. He then completed a fellowship in Corneal and Refractive Surgery at the Bascom Palmer Eye Institute, in Miami, FL. U.S. News & World Report has consistently ranked the Bascom Palmer Eye Institute as the #1 eye hospital in the United States. Carlsbad eye doctor Dr. Tracy is Board Certified by the American Board of Ophthalmology. And he is a fellow of the American Academy of Ophthalmology. Prior to opening his current practice, Carlsbad eye doctor Dr. Tracy served as a medical director at TLC Laser Eye Centers, and has performed thousands of surgical procedures, such as LASIK eye surgery and Surface Ablation (PRK eye surgery), Cataract surgery, and Pterygium removal. 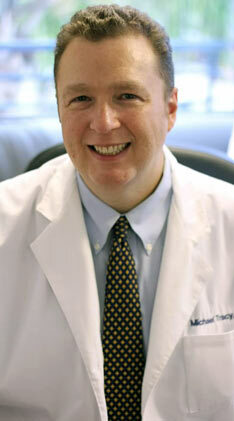 In his free time, Dr. Tracy enjoys spending time with his wife, reading, and watching movies. Additionally, Dr. Tracy provides volunteer services for EyeCare America, a Foundation of the American Academy of Ophthalmology.